Take a flight over Hoover Dam, Lake Mead, and the Grand Canyon for remarkable aerial views. Land at the Grand Canyon West, where the Skywalk Bridge awaits. You will 4,000 feet in the air and gaze right down to the canyon floor! 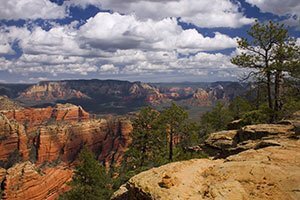 This tour features everything the West Rim has to offer! A helicopter flight from Las Vegas takes you to the West Rim and lands at the bottom of the canyon. Relax on a smooth water boat ride down the Colorado River, then stand a mile high on the Skywalk Bridge. 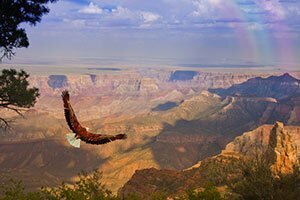 Experience the culture of the revered Hualapai people when you visit the West Rim of the Grand Canyon. Visit the Native village to find ancient dwellings and authentic crafts, then see the majestic Eagle Point atop the the extraordinary Skywalk Bridge. This tour starts with an airplane tour to the West Rim, where a helicopter will take you to the canyon floor. Next is a pontoon boat ride between the canyon walls and admission to the world-famous Skywalk Bridge. Get the VIP treatment when our luxury motorcoach takes you to the Grand Canyon West Rim. See the magnificent canyon walls from its best vantage point: suspended 4,000 feet in the air on the Skywalk Bridge. The Grand Canyon is a landmark that most on this Earth never have the opportunity to experience in person. When you spend a day exploring on one of our Grand Canyon Skywalk tours you can turn your vacation into a once-in-a-lifetime experience. The West Rim of the canyon offers not only unique perspectives of stone walls and landforms, but also features the Skywalk Bridge - one of this country's most exciting engineering achievements. Our Grand Canyon Skywalk tours offer adventures that take sightseeing to a whole new level - 4,000 above the canyon floor! Commissioned and owned by the Hualapai tribe, the Skywalk officially opened to the public in the spring of 2007 after 4 years of construction. Since its unveiling it has hosted about 2 million visitors from around the world. There are several structural elements that make this bridge the architectural marvel that visitors to the canyon flock to see. Extending 70 feet out from the canyon's edge, the Skywalk allows guests to stand quite literally in the middle of the air. 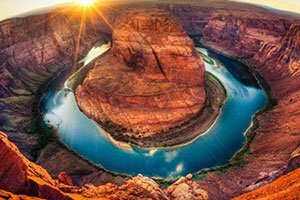 Its “U” shape gives a 180-degree view of the canyon - and the sights here do not disappoint. By far the most exciting attribute the Skywalk has to offer is its glass bottom; guests can stare straight through the floor on which they are standing and see the Colorado River flowing 4,000 feet below their feet. 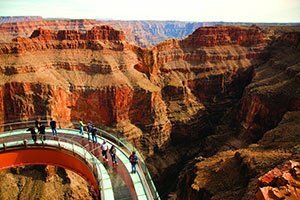 Our Grand Canyon Skywalk tours will fly you from Las Vegas to the West Rim, where you can experience the thrill of the Skywalk yourself. 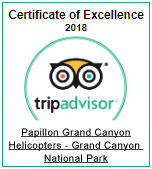 We offer a variety of Grand Canyon Skywalk Tours, from the most brief to the most elaborate, and can provide you just the type of tour experience you've been anticipating. 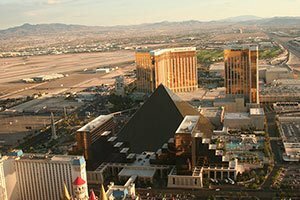 First our shuttles will pick you up from your Las Vegas hotel and transport you to our luxury airport. You will then board a state-of-the-art helicopter or airplane depending on the tour chosen. Both aircraft are specially equipped headsets with flight narration in 16 languages. Along the way you will see phenomenal aerial views of the Hoover Dam, Lake Mead, and the beautiful expanse of the Mojave Desert. Upon arrival at the Grand Canyon, a complimentary shuttle will take you to the Skywalk and other canyon lookout points. Many of our Grand Canyon Skywalk tours also include front-of-the-line access to the bridge. Your first steps out onto the glass floor of the Skywalk will be breathtaking. As the rock wall beneath you begins to drop farther from your feet, it truly feels as though you are walking on air across the canyon's expanse. When you reach the midpoint of the bridge you will be standing 4,000 feet above the canyon floor. By looking straight down you can watch the winding Colorado River eternally etching away at the canyon walls. Aside from looking down through the glass, the Skywalk has another fantastic sight to offer: Eagle Point. Located directly across from the Skywalk, this section of the canyon wall unmistakably resembles an eagle taking flight. This stone formation, naturally sculpted by the Colorado River, was revered by the ancient Hualapai people due to its similarity to the majestic bird. You can see the spectacular stone wings of Eagle Point perfectly from the Skywalk and can even pose in front of it for pictures. It is important to remember on a Grand Canyon Skywalk tour that while personal cameras and phones are welcome onboard our aircraft and while walking the canyon rim, cameras are not permitted on the bridge itself. Guests may store their belongings in lockers free of charge and may have their photo taken by photographers while on the bridge. Visitors will also be provided with disposable shoe covers that must be worn while walking on the Skywalk's glass floor. Our Grand Canyon Skywalk tours can be tailored to include any sightseeing interest you have. You can upgrade your tour to incorporate a thrilling helicopter descent 4,000 to the bottom of the canyon floor. You can even add a smooth water pontoon boat ride down the Colorado River. Back at the canyon rim you can visit other lookout points and a Native American Cultural Center. Here you can explore ancient dwellings, watch traditional dancing, and browse many beautiful crafts made by the Hualapai people. If you are one of the fortunate individuals who have the opportunity to visit the Grand Canyon, make sure you create the trip of a lifetime by experiencing this masterpiece in engineering. 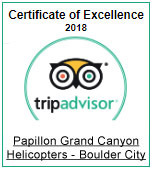 When you embark on one of our Grand Canyon Skywalk tours you will be given the attention and service that we believe all of our passengers deserve along with knowledgeable pilots and guides to answer all of your questions. Your trip to the West Rim will be made complete when you make those first steps out over the canyon floor 4,000 feet up in the air. Though it may seem daunting at first, standing midair over the vast expanse of the Grand Canyon is a moment you will never forget and will likely never experience again. On a Grand Canyon Skywalk tour the opportunities for adventure are endless. At Papillon, we want to make your journey as exhilarating and memorable as possible and are honored to join you along the way. We look forward to receiving your call (or click) to reserve your appointment!